The legendary Mikhail Ryabko is a Chief Instructor and founder of Systema. He is also a former Colonel of the Russian Special Operations Unit, with 25 years of real military experience. Watch Mikhail in New York and Moscow at his remarkable seminars, where he takes a stick into his hands and turns it into an incomparable training tool and unsurpassed fighting weapon. Expertly progressing from simple to more challenging drills, he prepares your hands, fingers and wrists for handling a stick and gradually works through the rest of the muscle groups. He guides you through partner and solo work and demonstrates subtle and exceedingly strong stick movements utilizing the wrist alone.In a clear and unique way, Mikhail shows how to fill the hands with freedom and power without tension. 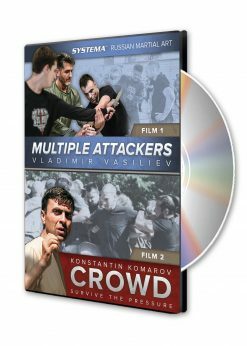 For the first time on film, you can see Mikhail’s famous stick work while gaining the deep and profound skills necessary for training and applying the stick in a confrontation. All explanations in this film are in both languages – English and Russian. Все обьяснения в фильме – сохранены и на русском, и на английском языках. I just received a copy of the just published Stick Seminars from Vladimir Vasiliev. 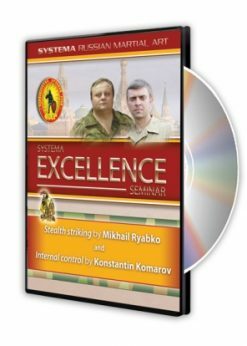 This is another Five Star example of a inspirational Systema DVD. The content is from two Stick Seminars by Mikhail Ryabko, one in New York at Fighthouse and the other in Moscow. There are two parts to each event. The first part is the Preparation Drills for conditioning and development with the stick, both as solo and partnered exercises and the second part is Stick Applications. One tends to want to jump forward to the Applications section of a DVD and that would be a mistake. These Preparation Drills with the Stick, while having obvious application to the handling of a stick, in both offensive and defensive aspects, also develop total body strength and coordination. Mikhail starts with developing proper grip of the stick, which involves using only the tension you need below the wrist to work in any direction, arm range, and body position from standing through to and including on the ground with the grip tension directed against an imaginary resistance from upward, downward or side directions. There is a very good explanation by a student in New York during this DVD section, who used to lift weights and now uses Systema exclusively for its fitness benefits. He describes his experience with the Stick and Systema as a total fitness regime, which leaves your strong, vital, adaptable and tension free, whatever the challenge, where as weight training gives you a limited mechanical strength, increasing muscle tension, while decreasing mobility and adaptability over time. Mikhail then demonstrates how to maintain a grip that translates as both as mobility of the wrists and strength of application, whether that be strikes or throws. He shows how easily tension can back up into the shoulders if you get it wrong, but, and this is the IMPORTANT part, if you get it right, you can build the same kind of density in the fists and the forearms that we aspire to in Systema strikes. You can see this for yourself just by watching how Mikhail holds the stick and then watch how he strikes without the stick. His fists and forearms look the same. They are very full (dense), while his upper arms and body look fluid and relaxed. It was this gem that was so inspiring for me. I could see how this kind of stick training could be easily used to develop hand-arm density for a more effective use of force in strikes, holds and throws, while eliminating the superfluous tension (counter-force), which is the most common correction in Systema. I decided to test my observation . That night I went to teach class at Systema Downtown and took the students through Mikhail’s set of exercises. The first hour of drills after the warm-up culminated in removing the stick and using the accumulated density in our arms for fist-pushing and strike applications. The students experienced a very high level of concentrated tension-density in their fists and forearms, while feeling very light, adaptable and relaxed in the rest of their movements. One of the most interesting comments was that the presence of the stick helped students to not become lost in their own sensations or lost in the movements of the opponent. The presence of the stick enabled them stay more clearly defined in their work, while staying more connected to the opponent. The stick seems to draw one’s intention and attention into a more effective balance. The trick is to take this way of working and apply it under all circumstances, especially in the absence of the stick. The Applications section of both New York and Moscow Seminars is well worth the wait. Here Mikhail shows how the wrists strength and freedom are able to translate into very effective application whether you or the opponent has the stick. While the Preparation Drills section of the DVD shows you how to develop proper use of forearms and hands without tension in the rest of the body, the Applications section shows you how to use the other persons tension against them. The stick makes the tension between the attacker’s hands, and how that tension crosses the body in varying dynamics, quite obvious to the observer. Time and time again Mikhail shows you to use subtle changes of direction, coupled with a measured use of one’s force, to throw the opponent to the ground. Mikhail exhorts us to work slowly, so that we can 1) measure our use of power carefully, 2) minimize our movement, 3) clean out any extra tension we may be bringing to the application because of our over-use of power, body movement, or ideas about how we should move the other person. The result of this is demonstration after demonstration of what can only be described as sublime application. 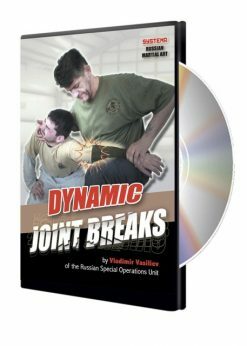 Of course you can develop an inventory of techniques against the joints, as well as precise strikes from watching what Mikhail does to his opponent, but this is not what he is there for. Mikhail keeps bringing us back to the basics of how we move, breathe, relax and stay present with what is going on. This is a great DVD from at least two points of view. If you want to know how to use a stick, offensively and defensively, you will be very happy with both the development of your skill with handling the stick, as well as being able to pin-point the vulnerabilities of the opponent. 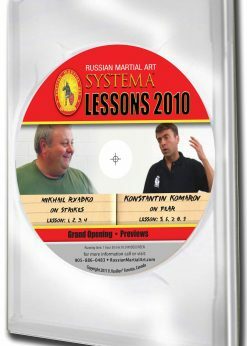 If you want to know about how Systema works and how to take you overall work to another level, then Mikhail’s use of the stick to illustrate the principles of power development, tension versus relaxation in self and other, as well as stillness versus movement, then this DVD is a goldmine. This is not only my opinion, but that of all the Systema Downtown students who tried this work out, as well as Frank Arias from Headquarters who was visiting for the evening and helped demonstrate some of this with me. Thanks once again to Mikhail for the consistency of message as to what Systema is all about, how to get there, and how to eliminate all that is unnatural in our movements and thinking. Thanks to Vladimir Vasiliev for another great production! 1.5-hours of unbelievable, fascinating & brilliant work of the Master. Variety & depth, simplicity & sophistication, economy & effectiveness of the Systema stick applications – all of it & much more on the new addition to my video library. Systema stick work is the world by itself – just an introduction to a conditioning segment of it makes gym membership to seem like a waste, while fighting application possibilities are endless. Add demo by Mikhail Ryabko & you have the Work of Art, but it does not stop there. Comments & explanations in Russian & English are crystal clear & truly exceptional. Concepts, principles & specific drills offered by this film are so unorthodox & universal that familiarization with them will benefit any individual capable to move. Garden tools, walking sticks, long barrel weapon can be used for general conditioning, self-defense & combat training – there’s no tool more democratic than a stick. Many thanks to Vladimir for another opportunity to own a snapshot of the Great Mastership. Thank you Vladimir for releasing this DVD. It is very informative for a better understanding of Systema! 1) Maintaining tension in the wrists (the full hands-arms concept) during a range of movements, distances, and angles. 2) Turning wrist exercises – from simple to more complex movements. 3) The origins of all stick movement within Systema – as u can guess from concepts 1) and 2), it is the wrists – and why. Also covered in this concept is the idea of less movement and why it’s better. 5) Negating tension through the understanding of body structure – this is demonstrated on several partners. a) Mikhail gets people into very unusual and uncomfortable positions with the stick. Often, the person is trapped through their own movements, Mikhail’s movements, a combination of both, or even because of the object of the stick itself. The last one is most interesting to see happen. c) I found one of the most interesting things to watch was how the stick was being held by Mikhail and how this allowed the stick to be used with such grace and versatility. No spoilers here – watch the DVD to understand what I am getting at with this last point. All I will say is that I don’t think this work has been seen before outside of Russia before Mikhail and Vlad introduced it to the West, and looking at it, I cannot think of anyone who has even come close to these types of movements with the stick in their hands. They are fluid, versatile, efficient, deadly yet controlled and controllable…that’s all I can really say on this. There were also some great 3-man exercises with the stick I have never seen before but would love to try in class and intriguing ways of removing the stick from the opponents possession. all the things that Mikhail was talking about in the DVD within his movements. His work was an inspiration to watch and served as a summary to me. 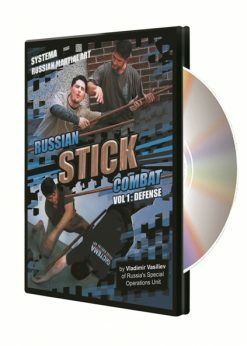 I would highly recommend this DVD to any individual seeking to learn more about the stick as a weapon. I watch with great attention the footage of Mikhail Ryabko in his films. A dream mastery to reach !